Arrowed: CW Arrow Cast Brings Deathbolt into the TV-Picture! I did a CW Arrow TV-Show Comic Keys rundown a few weeks ago and I will be updating that very soon. On Wednesday it was announced that the freaky looking guy from the Hellboy Movies, Doug Jones, has been cast in Arrow as the Super-Hero Villain Deathbolt. Deathbolt can literally inhale electrical energy which he than blasts at his enemies. Pretty much what I’m saying is, he’s Raiden from Mortal Kombat. 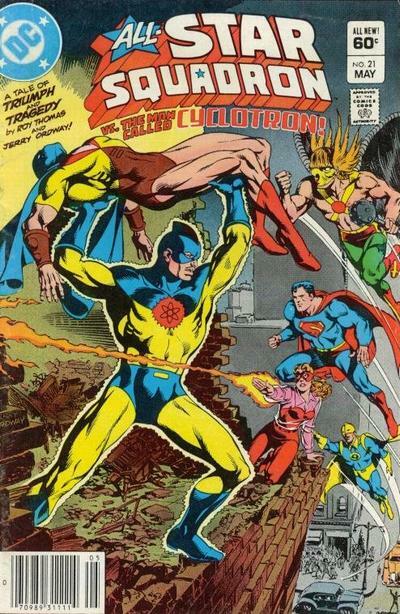 Deathbolt’s first appearance is All Star Squadron #21 from 1983. All reasonable copies on ebay have been sold however, this book is very findable in the wild for under $5! This book has tremendous potential depending on how he is used and developed in the TV-Show! Speaking of Raiden, the Mortal Kombat X, currently under development with a expected release date of April, seems to have a lot of really cool comic related downloadable content in the pipe stream. With Todd Mcfarlane giving the game developers permission to use Spawn and the plans of having Predator with Carl Weathers as a downloadable character – the comic book tie in is one you should be holding on to. Already hard to find, when the video game comes out, Mortal Kombat X #1 going to be on fire.